Welcome to Crystal Beach fishing, Crystal Beach fishing guides, Crystal Beach charter services fishing on Galveston Bay and surrounding areas. Welcome to Galveston Bay Fishing with Capt. 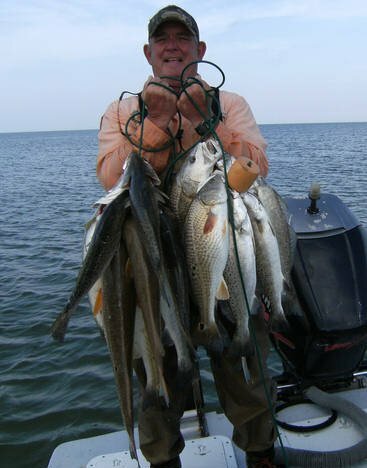 Jimmy Trahan, Galveston fishing guide with the experience to put you on the fish! Galveston fishing offers exciting trout, redfish, and tarpon fishing charters out of Galveston, Texas. Book your 2018 trips while there are still open dates. At Galveston Bay Fishing with Capt. Jimmy T., our clients satisfaction is our number one goal. Capt. Trahan looks forward to hearing from you soon! 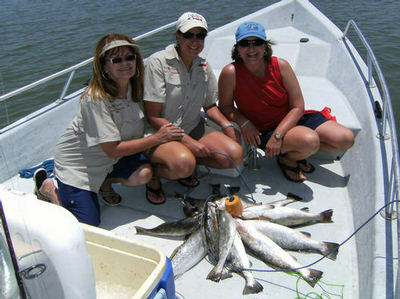 Specializing in trophy trout and redfish - Fishing Galveston Bays! We Offer Galveston Offshore Fishing & Galveston Bay Fishing! 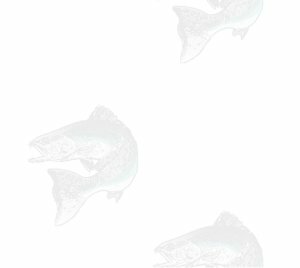 Wade fish or drift fish for Speckled trout, Red fish and Flounder in one of the best fisheries on the Texas Gulf Coast. We are located at Crystal Beach and fish surrounding areas. Give me a call to book your next Crystal Beach - Galveston fishing charter or hunting trip. 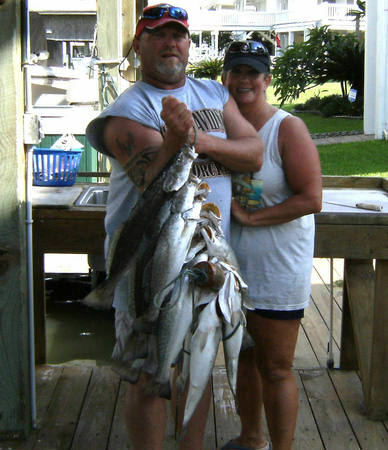 You can be sure you will experince the best in exciting Galveston fishing and hunting action! Capt. Jimmy is a licensed full time fishing and hunting guide. Capt. Jimmy has been fishing since early childhood on the Bolivar peninsular, fishing for everything from hardhead catfish as a child to trophy Trout and Red fish. I have been guiding for the last 30 years, the last 15 years directing most of my guiding in the Chandleur Island with Chandleur Island Guide Service. Come let me customize a fishing trip for you, family and friends on Galveston Bay. Novice and Experienced anglers always are welcome. Come and enjoy a smooth dry ride in my 24ft El Pescador boat powered by 150 HP Yamaha. I have lodging available thru Oyster Bayou Lodge near Anahuac with several boat launches only a short distance away. Package deal thru the lodge are available that include guide service, lodging with meal. The lodge can accommodate up to 25 people for one night or more. $100 per person minimum of three people. Includes meals ( Guide fee not included). two nights in the lodge all meals and guide fee included. $500 per person - minimum of three people.